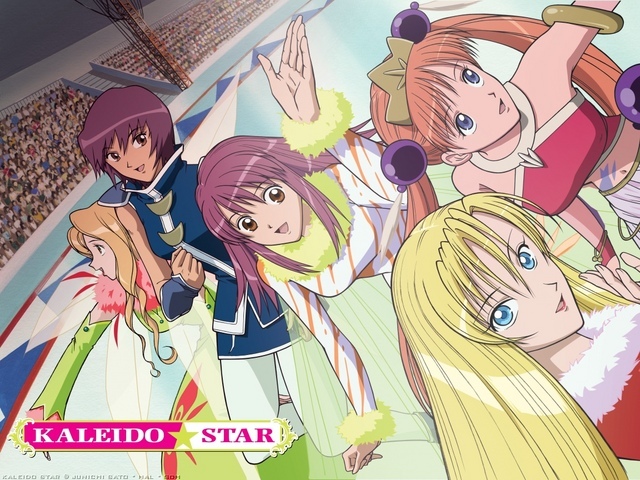 Kaleido Star | Anime With A Side Of Sarcasm! Funny anime that doesn’t get too boring. It always finds a way to entertain. Story to sum it up is based around a girl, Sora, that travels from Japan to the US to try to audition to be part of the Kaleido Stage. Through a set of ups, downs and a few accidents, she makes it into a small minor role but is not loved by her co-workers. Go figure. As the story progresses so does her skills in acrobatics and her relationships with the cast. Eventually she is in a place to compete for a starring role against her biggest competition and rival. The competition seals her fate at a promising star and gains the respect of her biggest rival, Layla. I really do feel bad for the girls though then have to go through a boot camp to train for a big showcase in the first season. Crazy insane! Bad part in both seasons is there is a bit too much whining at time from some of the background characters that make you just want to reach through the screen and slap the living daylights out of them to make them shut the damn hell up.